There’s a bright dividing line between the day before you or a loved one gets a mesothelioma diagnosis and the day after. One day, you’re just one among a million other ordinary families, going about your daily routine. The next, you’ve joined the ranks of mesothelioma families. For those who have made the unhappy transition to mesothelioma families, life will never be the same. Mesothelioma touches everyone in the family, not just the mesothelioma patient. As the Bankhead family found out, the lives of wives and daughters in mesothelioma families change forever too. After working hard all his life, Gordon Bankhead was ready to enjoy his retirement. He moved from his home in Livermore, in Northern California, to Valley Springs, a small town in the foothills of California’s Sierra Nevada Mountains. For Gordon, retirement was a dream come true. Valley Springs was a beautiful setting. He could play golf at the La Contenta golf course as often as he liked. He joined the Senior Men’s Club and went boating on the beautiful lakes near his home. When he needed a break from all this fun, he relaxed on vacation in Hawaii with his family. He and his wife Emily settled in for a sunny retirement. Then, in 2009, 10 years after his retirement from the Sea-Land Shipping Company in Oakland, he started to have trouble breathing. In January of 2010, he was diagnosed with mesothelioma. Emily and Gordon’s dream turned into a nightmare. They had become another one of the mesothelioma families. Anyone who drives across the Bay Bridge from San Francisco to Oakland can’t miss the Port of Oakland. Massive cranes rise above the water and stacks of colorful shipping containers stand waiting to be loaded onto the cargo ships that sail in and out of the San Francisco Bay. For 30 years, Gordon Bankhead worked at the port. He was a parts man, maintaining and fixing the machinery that kept the Sea-Land Shipping Company humming. One of Gordon’s duties was to repair brakes. He inspected them, ground them down when needed, swapped out bad brakes for new ones, and blew them out. Many of the brakes he worked with were manufactured by Pneumo Abex LLC and Carlisle Corporation. And – you guessed it – they contained asbestos. Every time Gordon Bankhead took a set of malfunctioning brakes and got them working right again, he may have breathed in asbestos dust. Asbestos is a naturally-occurring mineral that forms in thin fibers. It was used as an insulating material in brakes for many years because of its heat-resistant properties. Because of its spindly, fibrous shape, when asbestos dust becomes airborne, sharp little shards, too small to be seen by the human eye, can get stuck in your lungs. Over time, the asbestos fibers create an irritation and, eventually, that irritation can develop into mesothelioma or other asbestos-related diseases. Mesothelioma is a cancer of the linings called the mesothelium – the linings around internal organs, especially the lungs, and there is currently no known cure for mesothelioma. When Gordon Bankhead worked for Sea-Land from 1965 to 1999, he might have inhaled the asbestos that caused his mesothelioma on the first day he went to work there or the last day before retirement. Mesothelioma takes a long time to develop and often appears many decades after asbestos exposure; there is a long window for potential harm. Gordon worked hard to provide for his daughters, Tammy and Debbie, and to save for his retirement. He couldn’t have known that all his hard work would make his family one of the mesothelioma families. The saddest part about Gordon’s story, like the story of so many mesothelioma families, is that his death was preventable. Pneumo Abex knew that dust from the asbestos in their brakes was lethal in the 1940s, if not earlier. Both Abex and Carlisle were part of the debate at a trade organization about whether to warn the public of the dangers of asbestos brakes in the 1970s. The organization didn’t issue the warning. In 1977, an employee of Rockwell, another asbestos brake manufacturer implicated in Gordon Bankhead’s mesothelioma, was diagnosed with mesothelioma after a career of handling asbestos-containing brakes, so that manufacturer knew about the dangers, too. None of these corporations warned Gordon Bankhead or the thousands of other people just like him. Gordon continued to work on asbestos brakes without proper protection until he retired in 1999. Rockwell continued to manufacture and market asbestos brakes until 2000. Every year, approximately 3,000 people are diagnosed with mesothelioma in the United States. That’s 3,000 new mesothelioma families, creating growing ripples of heartbreak and loss. And it was all preventable, if only corporations had acted responsibly and valued human health over greed and the convenience of using asbestos. Gordon’s illness brought his happy retirement to an end. 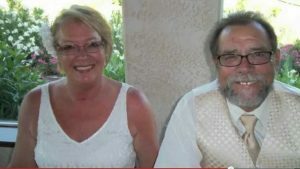 He and Emily moved from their retirement paradise in Valley Springs back to Livermore, so he could be close to his extended family during the time he had left. Like so many mesothelioma families do when confronted with this deadly cancer, Gordon’s children, grandchildren, and nieces, drew closer together to support Gordon and each other. In January of 2011, a year after his mesothelioma diagnosis, Gordon Bankhead had the satisfaction of getting justice in the courts. A jury awarded him and Emily more than $17 million in costs and damages. Sadly, Gordon didn’t have long to savor his victory. He succumbed to mesothelioma in October of 2011 at the age of 68. Without mesothelioma, his life expectancy would have been 17 years longer and he might have lived longer still, if he’d stayed in good health. His family was shattered, as so many mesothelioma families are. His wife Emily and his daughters, Tammy and Debbie, brought a second lawsuit, to recover damages for his wrongful death. They were awarded a second verdict of $11 million. No amount of money can ever compensate mesothelioma families for the loss of their loved ones. The life that Gordon and Emily planned was taken from them. But perhaps justice in the courts for mesothelioma families will send a message to corporations that their indifference to the health and safety of working people doesn’t pay. If that prevents more families from suffering, it’s worth it.